Special Counsel Robert Mueller has spent months trying to force former Trump campaign chairman Paul Manafort to flip on Donald Trump in the Russia scandal. Now that Manafort’s sidekick Rick Gates is cutting a plea deal against Manafort, it very much appears that Manafort will end up having to cut a deal of his own in order to avoid dying in prison. Now one MSNBC contributor says that if Manafort does flip, Trump will run for the exits. Gates is expected to officially plead guilty this week, and he’s already given his proffer interview, which means that Mueller now has the goods on Manafort. We’ll see how quickly this translates into a seemingly now-inevitable plea deal from Manafort. What is known is that Manafort has intimate knowledge of Trump’s political and financial life. Manafort ran Trump’s presidential campaign. In addition, Manafort, whose finances are one big international money laundering scheme with a heavy focus on Russian banks and Russian oligarchs, has bought real estate property from Trump. This analysis is apt. 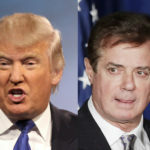 Paul Manafort does indeed have the goods to send Donald Trump to prison. If and when Manafort flips, even the ever-delusional Trump will understand that he’s hosed. He’ll try to negotiate some degree of criminal leniency in exchange for his resignation. Of course, even if Robert Mueller and the Feds are willing to give Trump a plea deal, he’ll still end up facing criminal charges brought by New York State the minute he leaves office.